While we think we have a willing buyer and seller on this deal, clearly negotiations have hit a stumbling block, with MON making it very clear that it is looking for other possible partners and BASF mentioned again in the recent press. Bayer’s response today with only a slightly higher bid as well as some payment guarantee if the deal does pass regulatory scrutiny may be explained by the perception of higher risk, on both sides. We believe there is real downside to MON’s share price if there is no deal with Bayer and/or MON acquires BASF’s business. 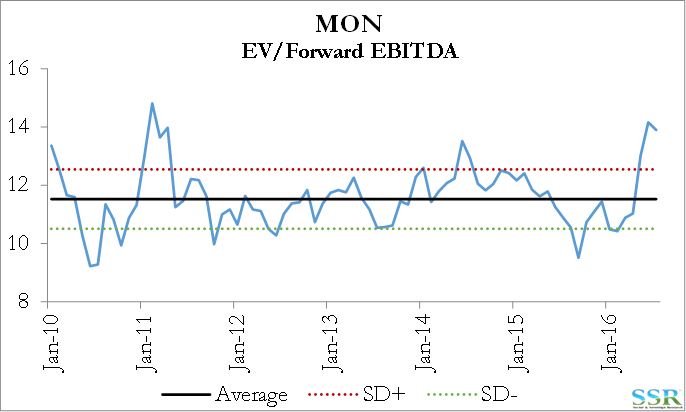 Current EV/EBITDA multiple for MON are at a peak. Fundamentals in Ag remain very weak and on a stand-alone basis MON is probably worth around $85 per share today – possibly lower if MON pays up to buy BASF’s business. A sale to BASF would be far more dilutive for BASF than the same deal with Bayer would be for Bayer and it is highly unlikely, in our view, that MON would get a higher price from BASF than Bayer. We think that currency in conjunction with regulatory risk might have become the stumbling block here and that perhaps Bayer is looking at what happened to Air Products in its failed bid to buy BOC in 2000. APD hedged the sterling exposure (which was the right move) – the regulators blocked the deal and APD had $600 plus million of cash hedging losses as a consequence. With Brexit and its likely fall out, (see recent research) there is a very real risk that the Euro could be lower a year from now than it is today – there is also risk that even if MON/Bayer announced a deal today it would take a year to go through the regulatory process – note the Chem China delays. Bayer may be stuck at a lower price than MON would like, to reflect the increased currency risk coupled with the regulatory risk. At the same time this is likely as good as it gets for MON given the move in earnings and the very high premium in its price already. We believe that a MON/Bayer combination is logical for both sides and creates a formidable competitor in the Ag space – neither company has a better strategic option at this time. We would remain long MON.